The foreign policy of the Koopa Kingdom toward its neighbor has always been unpredictable in timing and method. Although the Koopa Kingdom and the Mushroom Kingdom have engaged and cooperated with each other in friendly international competitions, critics have pointed out that relations between the two nations remained tense. While the Mushroom Kingdom and the Koopa Kingdom enjoyed a brief period of peace, the two countries were technically still at war with each other. While Bowser Jr. has seven older siblings, all of whom have participated in two major military campaigns in 1988 and 2009, it is widely believed that Bowser will name Bowser Jr. as his successor, and these attacks are an effort to ease Bowser's transition of power to his favorite son as well as to validate young Bowser Jr.'s high rank among the Koopa Troop. However, in the event of Bowser's demise, Bowser Jr.'s grip on power will be weak, and his role in the Koopa Kingdom will be that of a figurehead. Analysts suggest that Kamek, an experienced member of the Magikoopa elite, as well as personal advisor to Bowser, will play the part of regent to Bowser Jr. 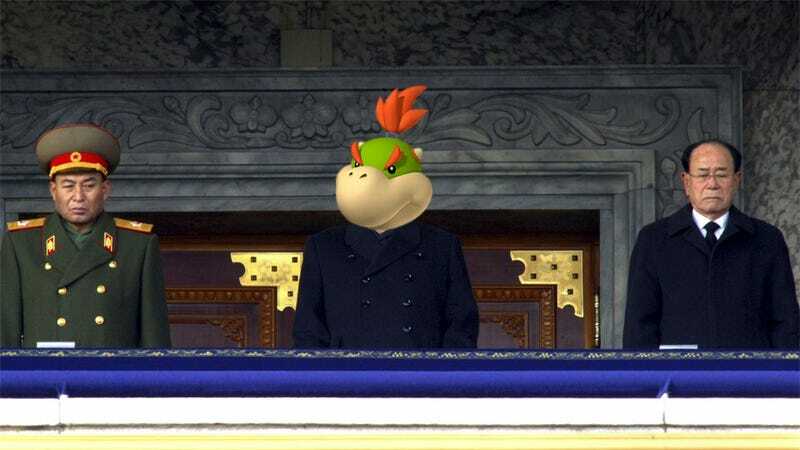 While I've substituted the players, and especially rapscallion mischief maker Bowser Jr. for real world tyrant Kim Jong-un, the rhetoric is alarmingly fitting for both. When I look at Bowser and Bowser Jr., I'm reminded of Kim Jong-il and Kim Jong-un and the sad conflicted history between the two Koreas. Here's why. Kim Jong-un, the leader of North Korea, recently promoted Kim Yong-chol, the man believed to have masterminded the sinking of the South Korean Navy warship, named Cheonan, in March 2010. Gamers may remember that the sinking of the Cheonan was the inciting incident of Homefront. Bowser, king of the Koopas, who breathes fire to attack others, and in return, is often destroyed by that same burning element, could not be a more fitting symbol of North Korea's dear dead leader, Kim Jong-il. Kim Jong-il, whose nuclear weapons, which he claimed would lead his country to prosperity, ironically deprived his country of real power. North Korea is one of the most isolated, one of the poorest nations in the world. The legacy of Kim Jong-il to his son, Kim Jong-un, is a country impossible to lead, unable to do anything but to be on full alert, spikes protruding outward. When I was a kid, I used to think of Bowser as a simple monster, easy to hate and difficult to kill. Then, I played Super Mario RPG: The Legend of the Seven Stars. I saw that Bowser was a strong ally, he had a wicked sense of humor, and he could compose haiku. By giving him human qualities, I realized that Bowser wasn't just difficult to kill off; it was an impossibility. I just started playing Mario Galaxy 2, and I began by thinking 'Again?' Nintendo's choice between funding another Mario Galaxy game and Mario Diplomacy is obvious; but for me, it's all the difference between rolling my eyes and a double take. Food for thought: Bowser's original Japanese name is "Koopa." Did you know that Kuppa is the Japanese word for the Korean dish "Gukbap," a kind of rice soup? As Miyamoto revealed in this old interview, other names that Miyamoto had considered were Yukke and Bibinba, two other Korean dishes.